Lords of Acid and My Life with the Thrill Kill Kult kick off their Sextreme Ball 2010 tour at Seattle’s Studio Seven on Tuesday, July 13th. 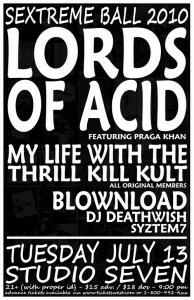 As an extra special treat, the great Praga Khan will also appear with Lords of Acid. This is a huge deal for electronic fans. I don’t think Lords of Acid has been to Seattle before, and to include original member Praga Khan, well, it’s a pinch me moment. I have loved Lords of Acid and Praga Khan since I first heard them. Thrill Kill Kult is of course absolutely awesome too. For more details and tix head to Studio Seven’s event page. Written by: Dagmar on 07/12/2010. This entry was tagged lords of acid, my life with the thrill kill kult, posted by dagmar, praga khan. Bookmark the permalink.